WATER treatment company Hyflux opened its $60 million global headquarters in Bendemeer Road yesterday. The Hyflux Innovation Centre will provide space and flexibility as Hyflux works to meet rising demand for water recycling and desalination. The energy-efficient, water-saving building complex houses offices and engineering design and technology commercialisation departments. Hyflux's rapid expansion, including into the Middle East, North Africa and India, dictated the move to bigger premises, said executive chairman and chief executive Olivia Lum. 'We believe that the next phase of Hyflux's growth is innovation-based and we need to do better with less,' she added. Some research and development and manufacturing functions remain at Hyflux's old headquarters in nearby Kallang Bahru while membrane manufacturing is being ramped up at its Tuas production hub. Environment and Water Resources Minister Vivian Balakrishnan congratulated the company at the opening ceremony yesterday, and said Hyflux's success was a prime example of the water industry's growth here. 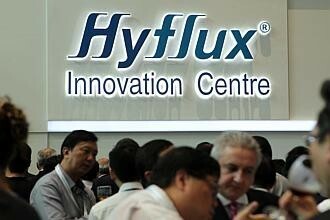 Hyflux shares closed one cent up at $1.375 yesterday.